The automobile had so dramatically changed the American way of life that the country’s first paved highway became synonymous with opportunity, adventure and exploration. More than just a road, Route 66 became a part of American culture, spawning hit songs and even a television series. Connecting Chicago with Los Angeles, the “Main Street of America,” as 66 was once known, served as a major artery for westward migration. Later, its path through Arizona’s Painted Desert and near Grand Canyon established it as a thoroughfare for vacationers. Without the benefit of today’s highway speeds a trip along its 2,448 miles, from the Heartland to the Coast, might have taken a week or more. Route 66 has since been replaced with a more efficient interstate highway system. But many communities preserved portions of the route as scenic byways or to serve local traffic. 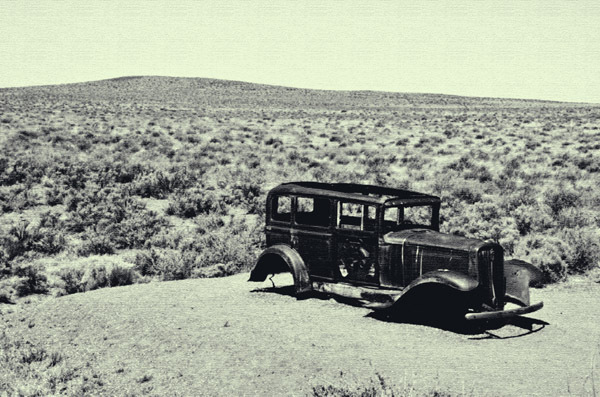 In other places, the road is gone but tributes remain – like this 1931 Studebaker that pays homage to the section of road that traversed an area we know today as Petrified Forest National Park. I blogged about this old car a couple of months ago, even asked readers what model it was — and nobody came up with the answer. I couldn’t find out either. I love it when I get my questions answered. We seem to continue following each other around. Anyway thanks. I’m going to blog about this today and I’ll put a link to your blog. Heh-heh-heh. We do seem to hit many of the same places. Glad to know that we were able to answer one of your outstanding questions. I’ve only been on parts of Route 66 (mostly in the Southwest), though I would love to drive more of it. Thanks for the inspiration. Cheers. Love the Mother Road. I don’t want to plug myself here but check out my blog sometime and you’ll see my novel about traveling down Route 66. It was a book that wrote itself because of all the great material spread over 2,400 miles of a national treasure. What you are doing is inspiring. I’m so happy to have found your blog! We’re having a blast and, with the blog, are hoping to inspire others to follow similar dreams in life. We’re happy you found us, too. Love old photos like these! “Old Looking” is what I was after with this shot. Glad you liked it. I’ve always been intrigued by the old roads of our country- 66 being the Big Mama. Thanks for writing- glad I found you! Stop by theusualbliss.com sometime for a little Park City peek. Congrats on FP! While 66 is The Mother Road, Bliss has it right that there are so many others. The Lincoln Highway – the Father Road – is the first to come to mind. Closely behind come the Yellowstone Trail and the National Road. The list is as close to endless as you can get!